In the High Street a large rock lies next to an old village pump. It was placed there in the 1890s by the Rev. W. Tuckwell, having recognised it as an ice age deposit, after it was found on the road to Napton. There used to be an iron fence surrounding the rock, but this was removed during the Second World War. Down in the (dangerous - don't go there!) quarries there are numerous springs that form large ice fountains in winter. The one shown below was about six feet high. Stockton has enjoyed some notable and eccentric vicars over the years. One such was the Rev. Willam Tuckwell, known as the Radical Parson. He spoke firmly in favour of land nationalisation and introduced allotments into the village, dividing up the Glebe land into plots for villagers, who eagerly took up their usage. Apart from Rev. Tuckwell, Stockton's most famous incumbent was Archdeacon Colley, who was rector from 1901 until his death in 1912. He was deeply interested in spiritualism and conducted séances in the rectory. He was notorious for having himself carried round the church during an evening service in a glass-topped coffin, which he kept in the music room at the rectory. He was also a keen musician and occasionally summoned the congregation to worship by blowing a cornet from the church porch or delivered baritone solos from the pulpit. In spite of his eccentricity he served the people of the village diligently, visited the sick and dying and was particularly good with children, for whom he gave lively parties. He rewarded those who could say their catechism by rolling apples or oranges down the 'speak-pipe' from his summer-house. The Natural History Museum in London houses the fossilised skeleton of a nineteen-foot long ichthyosaurus dug up in the local quarries in 1898. 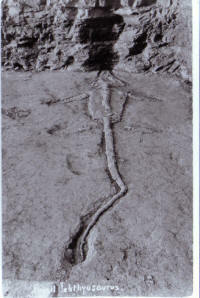 Similar skeletons have been found in deposits from Warwickshire down to the Dorset coast. Places sharing the name Stockton exist in Cheshire, Durham, Herefordshire, Norfolk, Shropshire (where there are two! ), Wiltshire, Worcestershire and North Yorkshire. There are others in America - in Kansas, in New Jersey - where the song 'There's a small hotel' was written and in California where they hold an annual asparagus festival!